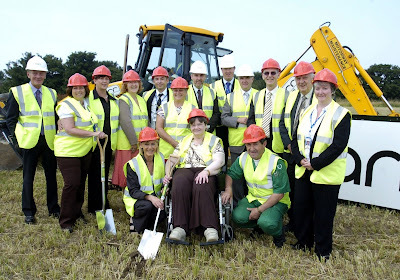 BUILDING work is now officially underway at the site of Girvan’s new £21.5 million Community Hospital, following a sod-cutting ceremony on Monday 28 July. 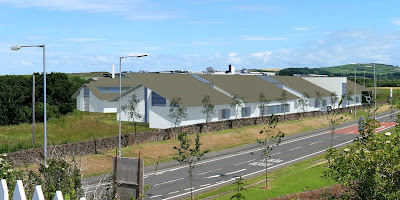 The new building will offer a range of services to the residents of Girvan and its surrounding villages, housing Girvan’s two General Practices along with inpatient accommodation, a Rehabilitation Unit, Outpatient Department, Community Casualty facilities and imaging (for example, x-ray). The facility will have 26 inpatient beds, all en-suite to meet modern standards in terms of patient privacy and dignity. The Bridgefield site will also host the Scottish Ambulance Service and South Ayrshire Council’s Social Services, including offices and interview accommodation. And the innovative building is looking after the environment, too. It will use a number of renewable technologies, including a wind turbine, a biomass boiler plant which burns wood pellets to produce energy, and equipment to collect rainwater to use for flushing toilets. [Pictured: Front row - South Ayrshire Council Provost Winifred Sloan, Sheena Scott (South Ayrshire Disability Forum), Robert Jess, (Station Manager, Scottish Ambulance Service). NHS Ayrshire & Arran chief executive Dr Wai-yin Hatton and chairman Professor Bill Stevely CBE were among the guests at the ceremony, with Professor Stevely taking one of the spades to perform the ceremonial cutting. Dr Hatton said: “We want to improve the quality of the health services available to the people of Girvan and the surrounding areas. This new hospital will allow us to provide an effective and flexible service locally. The local Public Reference Group have been involved in the development of the new hospital since the early design stages, and discussions are now taking place with them about the possibility of including internal and external artwork to commemorate the Davidson Cottage Hospital and celebrate the affinity local people have with it. Local contractor Barr has been awarded the main contract for this development. Construction work is due to start in August 2008 and will be completed in the winter of 2009. There are currently 307 Ayrshire business stories permanently archived on this site. To locate those of most interest to you, please use the site search facility in the top left hand corner of this page. Type your search term in the white box, then click “SEARCH BLOG”.